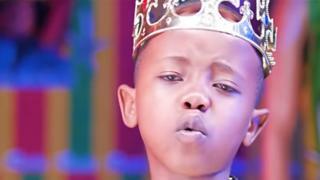 A Ugandan child rapper has been told to put down his microphone because he is too young to perform. Youth minister Florence Nakiwala told the BBC that the country’s labour laws state that no-one under 18 should work. In a television interview on Uganda’s NBS channel, she also warned that if the seven-year-old rapper Fresh Kid disobeyed the law he could face juvenile prison. Child labour has been hard for authorities to stamp out, reports the BBC’s Catherine Byaruhanga from the capital. Children are regularly seen working on farms, in small businesses and street vending, she says. Ms Nakiwala expressed concern that Fresh Kid, whose real name is Patrick Ssenyonjo, missed school since he was always busy working when other children his age were studying. But his manager insists that the child star has continued going to school. Francis Kamoga told the BBC that the rapper only performs on Saturdays and Sundays and has only had two shows, one music video and three songs since the start of the year. He added that he is not working and does not get paid. “I discovered him in a rural village miming some songs, brought him to the city and started paying his school fees” he said.